IGG offers an asymmetric risk-return investment opportunity with an estimated 68% upside and a 15% downside. Management continues to keep its subsidiary’s high-potential platform a secret, and most investors are missing this opportunity. 2018 results were strong, without adding any hit games to its portfolio. 2019 is expected to be a high-growth year for IGG with the release of its instant hit game Mobile Royale. 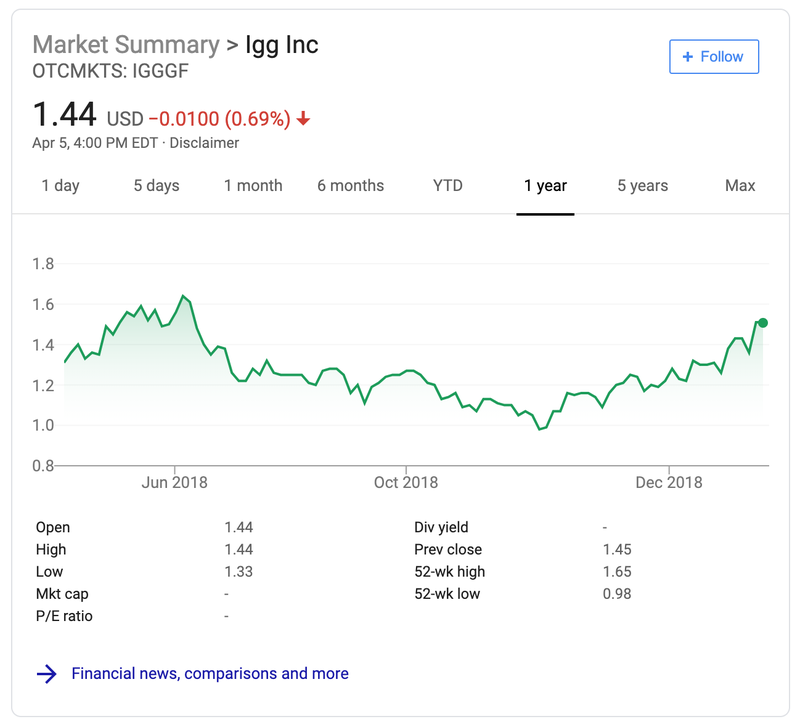 I last wrote about I Got Games (“IGG”) (OTCPK:IGGGF) in October 2018 discussing its underlying subsidiary that the market is missing, and initially in May 2018 with an in-depth analysis to help put the company on investors’ radars. Here in early April 2019, I am revisiting the company and will be discussing its recently released 2018 Annual Report. We will first revisit IGG’s subsidiary, PocketSocial, then its 2018 results, my expectations for 2019, and its current valuation at today’s prices. Unfortunately, but not all that surprisingly, management did not mention its subsidiary PocketSocial, Inc. in its 2018 Annual Report. This means we did not receive any specific data in regard to how PocketSocial’s lead product, StreamCraft, performed over the last year. However, given the potential size of this platform, and therefore, the impact on IGG’s business, it is worthwhile to dig deeper into. Through my non-traditional research, I have been able to piece together some data about the platform’s success. First, in regard to the anonymity and secrecy of the venture from management, after seeing the Operations Manager’s description on LinkedIn (below), I am not all that surprised it has been tightly held to their chest. I assume this description is from when this individual became the Operations Manager, at which point the platform hadn’t been announced to the public nor had it been released yet, but it does indicate that management did not want much information about it released. This leads me to believe that the situation is the same to this day. Management is likely waiting for a longer history before reporting on its results and potential. In a short video PocketSocial recently released on LinkedIn, it discussed its results over the past year. 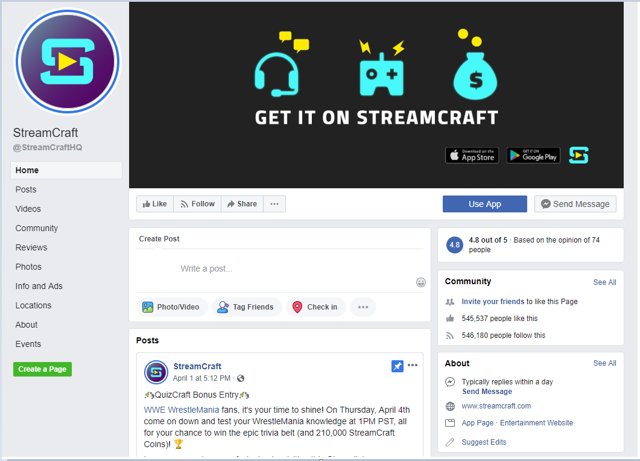 The platform launched on February 14, 2018, and by the same date in 2019, it had over 2 million monthly active users (MAUs), 10 million monthly page views, 1,000+ partner streamers, and paid out over $1.5 million to its streamers. On the Google Play store, it already has nearly 30,000 reviews and over 1,000,000+ downloads. Of the common social media platforms, it appears StreamCraft is most active on Facebook. On its Facebook page, it has nearly 550,000 followers and likes. I realize much of this data and research is not “traditional”, but that is precisely why I believe it is so valuable. This is a business within IGG that could one day be worth more than some of its largest game franchises, and most investors are missing it because it is not discussed in the company's annual reports. 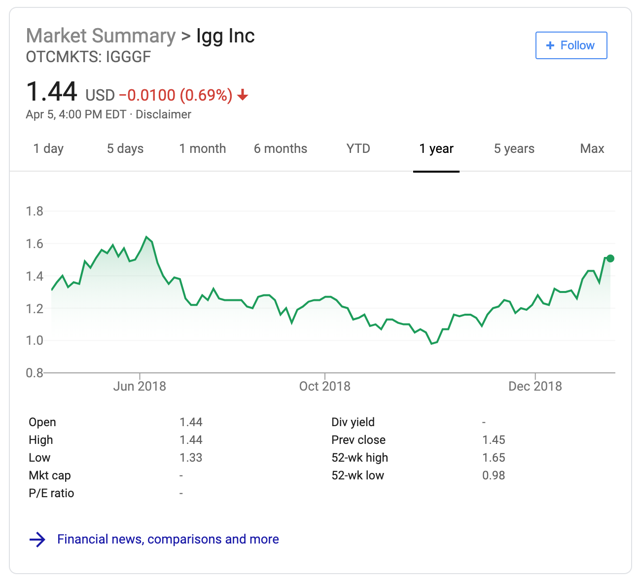 By looking deeper into a company than just its annual report or financial results, investors are able to discover truly great investment ideas before the rest of the market is aware of them - that is what I believe is occurring at/with IGG. Revenue, net income, and free cash flow grew 23%, 21%, and 38%, respectively. IGG continued to buy back stock, having bought back about 50 million shares. Coupling the share buybacks with growing net income, EPS was up 27% year over year. IGG’s already very strong balance sheet continued to get even stronger throughout 2018. Not only does the company not have any outstanding debt, but the amount of cash it currently has on its balance sheet ($288 million) is more than two times the amount of its total liabilities ($117 million). What is important to note about IGG’s 2018 results is that it did not have any material changes to its business; the company did not release any new major games, products, or services. This growth was impressive because it was driven primarily from games it already had in its portfolio. If the company had released multiple new games, these results would not have been as impressive, but given its growth is organic from games that are 3+ years old, the results are great. This also excites me about IGG’s game pipeline, because if the company is able to grow older games this much, its growth should increase rapidly when it releases new games and grows its released portfolio. 2019 is setting up for just that - even stronger growth than 2018. In its annual report, IGG announced it released a new game called Mobile Royale within the first two months of 2019. By the time of its annual report release date - late March 2019 - Mobile Royale already had more than 4 million users. Combining Mobile Royale’s growth with its legacy games’ growth, I expect IGG to grow its revenue 35%, net income 34%, and free cash flow 12%. Beyond 2019, I expect growth to continue for IGG through 2020. Mobile Royale will have been released for one year, allowing enough time for the company to market it and for the game to gain substantial traction. I expect StreamCraft will grow rapidly from now until the end of 2020, where it will become a material part of the business, forcing management to no longer ignore it and provide data to shareholders. Management has also stated it has multiple high-potential games in its pipeline. I expect 1-2 of these games to be released and grow into material hits between now and the end of 2020. Two of the games in its pipeline are sequels to major hit games Clash of Lords and Castle Clash. Building on already successful franchises, I expect the sequels to provide great growth for IGG through 2020. As of this writing, the stock is trading at about $1.44 per share in the US on the OTCMKTS. The stock is relatively illiquid in the US on the OTCMKTS, and is far more liquid on the Hong Kong Stock Exchange (trades under 0799.HK). 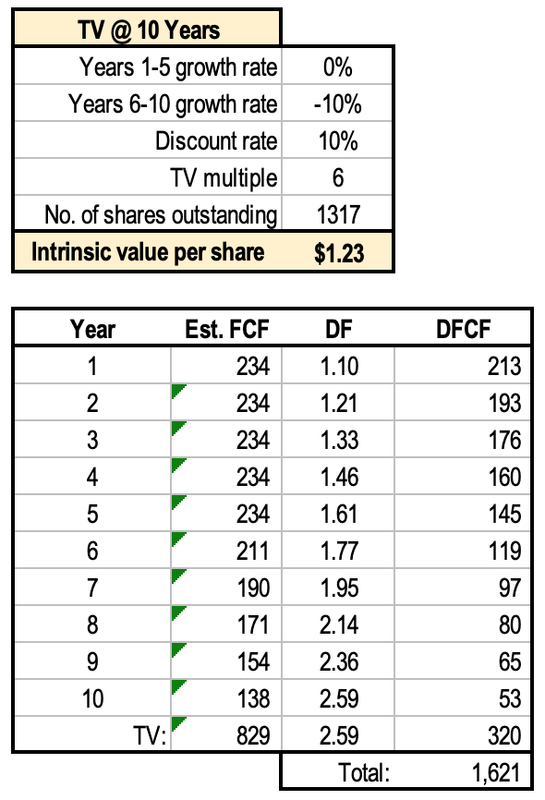 We are going to value IGG stock using a discount cash flow (DCF) analysis outlining three possible scenarios. First, we will look at a situation where the company is not able to grow its cash flow for the next five years, then its business is eroded due to competition or failure to produce hit games. Assuming no growth for the first five years, then a -10% decline per year for the next five years, a 10% discount rate, and a 6x TV multiple, IGG stock is worth about $1.23 per share, or about 15% lower than today’s price. I believe this is a worst-case scenario for the company over the next decade. Assuming this is true, investors have a potential 15% downside from today’s prices. Next, we will look at a situation where IGG is not able to grow its cash flow at all over the next decade, but also does not decrease its cash flow generation. Assuming no growth, no share buybacks, a 10% discount rate, and a 6x TV multiple, the stock is worth about $1.50 per share, about 4.2% higher than today’s price. Finally, we will look at a valuation analysis that illustrates what I believe to be the most likely scenario. 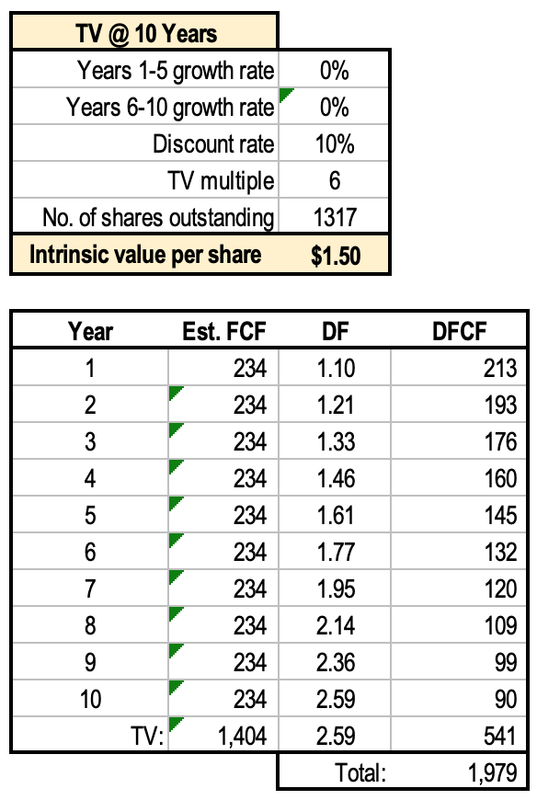 Assuming 12% annual growth over the next five years, 5% annual growth for the following five years, a 10% discount rate, and a 6x TV multiple, IGG stock is worth about $2.42, about 68% higher than today’s price. What makes IGG different from most tech companies is that it not only has double-digit growth, but it is growing profitably, generates and saves a lot of cash, has an exceptionally strong balance sheet, is undervalued, and pays a healthy dividend (about 2.5-3% dividend yield). Management continues to illustrate its ability to successfully run this business, while its interests are closely aligned with shareholders through large insider ownership. An investment in IGG is not without risk (discussed in-depth in my previous articles), but the estimated 68% upside greatly outweighs the estimated 15% downside, creating an asymmetric risk-return investment opportunity. The outstandingly strong balance sheet and management’s ability makes me confident the company will be able to overcome the risks and weather a storm. Given my long-term investment strategy, I expect to own positions for many years, mitigating the risk from an illiquid stock traded on the OTCMKTS exchange. Overall, an investment in IGGGF is an opportunity to own a great business at a good price, with a great management team, competitive advantages, and a margin of safety. With the asymmetric risk-return profile of this investment, I will continue to add to my position in I Got Games and collect a healthy dividend. Everything included in this article is not to be taken as investing advice because I am not your investment adviser. Also, I have not considered your specific situation as your fiduciary. Investors are expected to do their own due diligence before making any investments and should consult with an investment professional who knows their objectives and constraints. Disclosure: I am/we are long IGGGF. I wrote this article myself, and it expresses my own opinions. I am not receiving compensation for it (other than from Seeking Alpha). I have no business relationship with any company whose stock is mentioned in this article.